The workshop was to promote the Project 500 initiative who’s aim is to recognise and celebrate women in all aspects of sport. The workshop started with Lara Morgan, a business entrepreneur who started her own business at the age of 23 years talking through her vision for success and explaining how sport helps her in her business. Her straight talking and no nonsense approach was great to hear. As female sport coaches she believes we all have a responsibility to be positive role models to girls and women and try and make a difference. Her latest business venture is “Activbod” which is a skin and body care range and her pledge will be to use this company to finance sports facilities. So when you see the little lime green packaged Activbod in Boots…it really will make difference in the future. And she is a keen triathlete. Richard Cheetham was the second guest speaker and he invited the audience to be creative and challenge the way we approach our coaching. His story telling and activities were infectious and I now am the proud owner of Rory’s Story Cubes and three space hoppers…all of which are part of the coaching kit bag! A really entertaining and thought provoking session which demonstrated to me that many of the coaches in the room had hundreds of ideas to sell and could not wait for the opportunity to try some of them out! Richard gave us permission to be creative and run coaching sessions which are fun and encourage people to want to come back. The day concluded with a question and answer session and I was asked to be part of this panel together with Tamsin Greenway. What a great opportunity to talk coaching and triathlon! Tamsin Greenway from netball; Lisa Savage from football and Jenny from archery. The first question asked if any of us had suffered sexism in coaching and had to try harder because of it. Both Jenny and Lisa had been judged as “token” women coaches in a man’s sport and talked through how they proved they were good enough to coach. Lisa said that one of the best things that had happened to her was not getting through her coaching qualifications and having to re take them. This proved that she worked hard and was not given the award for being a woman. Tamsin explained that netball was a female dominated sport and she had not had problems with male coaches. I explained that in triathlon I had not felt intimidated by male coaches but I had run events to encourage women into the sport with female specific workshops and races in the past. 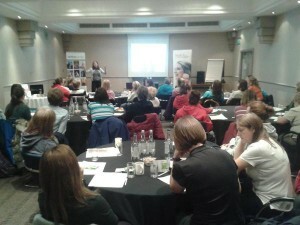 Time management was discussed with the audience asking how we manage our coaching commitments and family lives. We all agreed that coaching is time consuming but you have to maintain the right balance for you individually to keep the fun aspect so you continue to enjoy it. Occasionally you have to say no and not feel guilty about it as without the support from your family being a coach would be very difficult. How to develop as a coach was discussed and I raised the use of mentors as a great way of achieving this. In triathlon we have mentors who are free and committed to helping coaches adapt and improve. It is not always about taking the next qualification to develop; sometimes you can learn from new experiences and just need the opportunity to talk things through with someone. I also mentioned that the audience should take advantage of the networking opportunities provided with events like these as they we can copy and steal from other sports. So thank you to Coaching Hampshire and IOW and Active Surrey for inviting me to take part in his workshop.